This week see the peak activity of the Perseid meteor shower, the night of August 12/13, though you can see meteors for several days either side of the peak days. The meteors are caused by the Earth passing through the debris stream of Comet Swift/Tuttle and when bits of debris hit the Earth’s atmosphere they burn up. Perseid meteors can be quite bright and move across the sky rapidly, at the peak up to 120 meteors an hour may be seen. 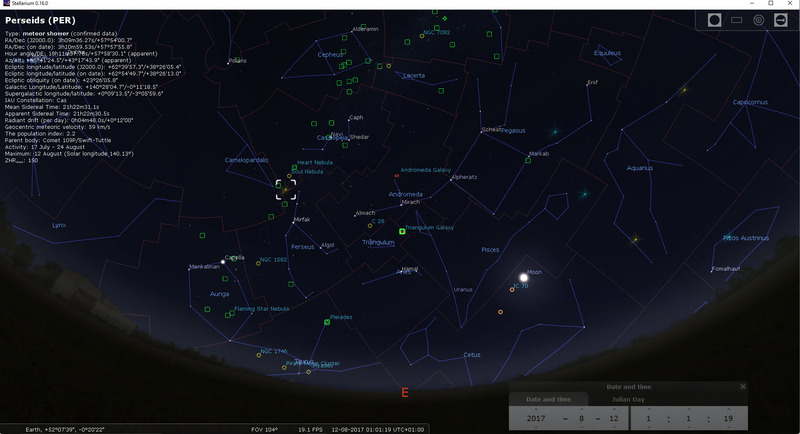 The Stellarium screenshot below shows where the radiant of the meteors will be on the night of 12 August. To observe them it is best to sit in a reclining chair and look more or less overhead; be patient and you will see them for sure. The best time is considered to be the hours before dawn. If you can find a dark site to observe so much the better, but even at home you will be able to see some meteors.